The League of Women Voters of Kent was proud to help sponsor the first #ElectHerKent State Training for female college students interested in running for student government. The training was coordinated by The Women's Center at Kent State University, consisting of Director Cassandra Pegg-Kirby, an LWV Kent member, and her staff, and also by the Kent State University Office of Diversity, Equity and Inclusion, led by Kent League member, Dr. Alfreda Brown. Other Kent members were: President Stacy Yaniglos, DEI staff member Natasha Curtis, Terrie Tarchinski Nielsen, KSU student Alise Vanatter and Amie Cajka. 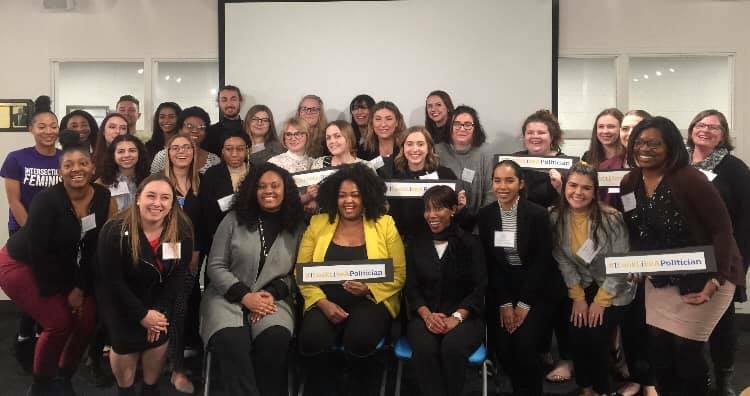 The workshop, presented by Running Start, a nonprofit organization, was developed in collaboration with the American Association of University Women to address the underrepresentation of women in executive levels of student government. The event helps break down barriers to women’s political leadership. League members networked with participants and provided information about the League. The program guided the participants to build a network, develop an elevator speech and go through the paces of a simulated campaign. The keynote speaker was Stephanie Howse, of the 11th district of the Ohio House of Representatives. The 11th District is in Cuyahoga County. We hope the Kent League particpates in 2020! Running Start Facilitator Allyson Carpenter is the youngest elected official in the history of Washington D.C.!! Marc Kirby photo. KSU VP and Kent LWV member Dr. Alfreda Brown of the Office of Diversity, Equity and Inclusion, left, and DEI staff member Natasha Curtis, also a Kent LWV member, at #ElectHer. Marc Kirby photo. With State Rep. Stephanie D. Howse, right, at #ElectHerKentState, supporting college students to run for office. With LWVK members Terrie Tarchinski Nielsen, Stacia Yaniglos and Amie Cajka and also attending Alfreda Brown, Natasha Curtis, Alise Vannatter and Cassandra Pegg-Kirby. Dr. Alfreda Brown, left, vice president of Diversity, Equity and Inclusion at KSU and State Rep. Stephanie Howse at #ElectHer Kent State 2019. Marc Kirby photo.